We are an active couple transitioning from our professional life to having more time to enjoy our passions and hobbies. We love to travel and explore remote parts of the world. We love to hike, bike and be out on the ocean. Maret enjoys gardening and is a fiction writer. Published book available on Amazon and Indigo 'When I Became Invisible'. Lyle enjoys working on his collector cars. Tofino is our home away from home that we enjoy sharing with our friends and guests. Skylights, Stain glass windows, Cedar trim throughout,stainless steel appliances, hardwood floors, outdoor warm shower and rain boots in all sizes. What a perfect, relaxing week. The ocean is definitely my happy place and this house is perfect for a low key holiday by the ocean. Lots of great walks on the beach every day. And love falling asleep to the sound of the ocean. We will definitely be back! We enjoyed a perfect week on Chesterman Beach. The Seascape is a wonderful property. We enjoyed morning walks on the beach just by walking out the door to the back of the property and down the three steps to the beach. Then back for breakfast and repeat for seven days. The kitchen is well-equipped and set up for easy cooking. The open plan allowed for panoramic views of the water and still provided privacy because of its setting on a slight berm. The bed was huge and luxurious with fine linens and pillow top comfort. We enjoyed the dining room table for meals and for playing Scrabble. The huge TV had a sharp picture and bright color. The hot tub was a pleasure.Thank you Maret and Lyle for a perfect week. 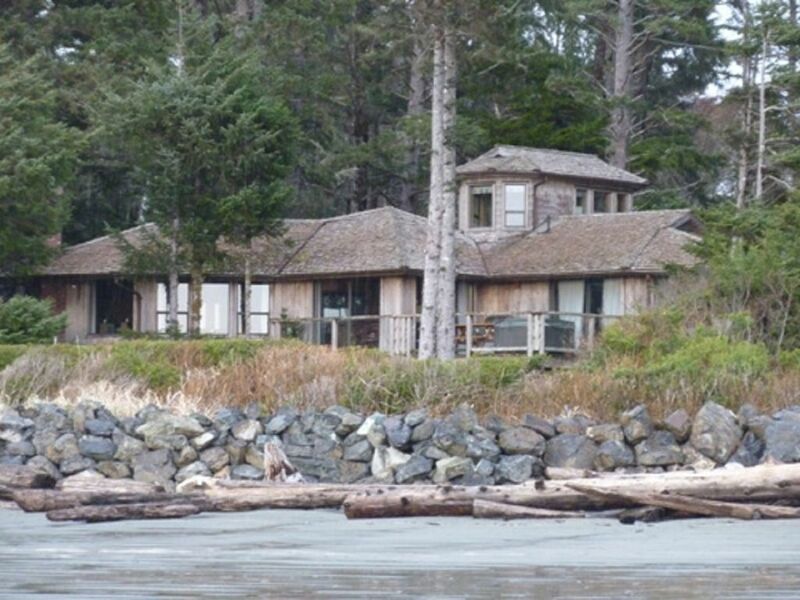 This was our first stay in this fabulous home on the world famous Chesterman Beach! And hopefully we will be able to stay again.It is so well located and the views are truly amazing. The home was well appointed and laid out. There were two couples and this home offers privacy and comfort for both. There was nothing more we could have asked for!!! We had a wonderful visit to Seascape in late October early November. The weather played a major factor as it was warm and sunny for our whole stay so we spent a lot of time wandering the beach and boogie boarding. Nice to have the outdoor shower and garage to hang wet suits. It was just two of us and our two Bernese and they loved the beach! Chesterman is doggie heaven. The green space right outside the garage door for the dogs to have a late night bathroom break was great. The house is very spacious, comfortable and clean. Very clean The kitchen is ridiculously well stocked with everything a cook could wish for. The beds are comfy. Everything was great from the throws on the recliners, puzzles and books, towels and beach toys. There's even a couple of indoor plants! Very much a homelike atmosphere. The hot tub was wonderful after being in the ocean and we used a bucket of water to rinse our feet prior to getting in. Pine needles are an issue. The breaker for the hot tub blew a few times and that's perhaps why it's so well marked in the electrical panel. We enjoyed incredibly colorful sunsets whilst having sundowners at the beach. The view is spectacular. We loved it so much we've booked it for next year. Had the most amazing stay! The house was amazing and the views were breathtaking!! The house was very clean and offered all the amenities we needed. The hot tub was an added bonus and the views from the deck were unbelievable. The booking process was super smooth as well. We will definitely be back again. Thanks for sharing your home with us. The house was fully equipped and had everything we could need. The property was quiet and the view spectacular. Would definitely stay here again. Quotes offered by VRBO are in US funds. Please use converter at top of Rates page to get Canadian amount. Please note the pet fee listed is based on one dog for 3 days. The nightly rate for pets is $15 per dog in Canadian funds.